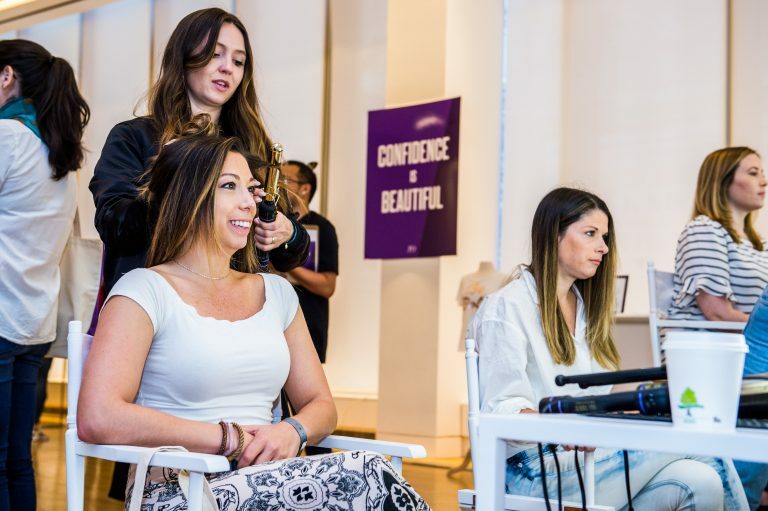 On a recent Friday, more than 600 Viacom employees, clients, and partners joined Viacom executives, as well as speakers from JP Morgan Chase, ColorComm, Refinery29 and WIE Network for The Girls’ Lounge. 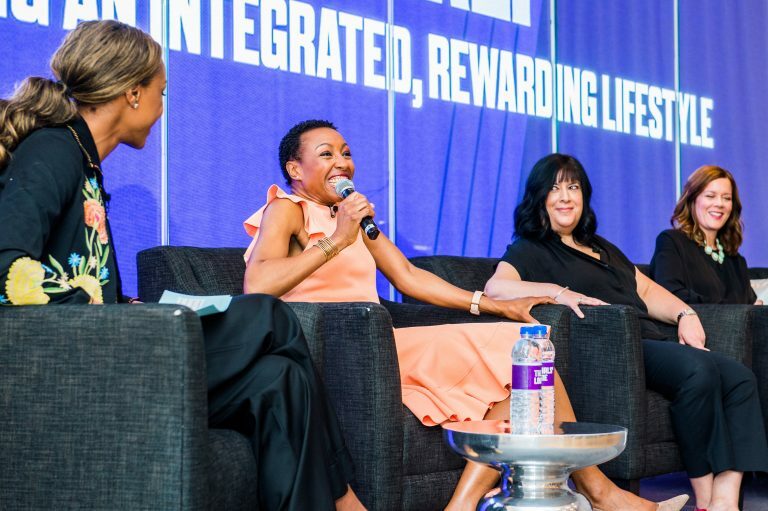 Co-hosted by Viacom and The Female Quotient, the event included a full day of panel discussions and professional coaching focused on work-life balance, leadership and diversity. Plus, attendees could schedule professional styling and headshots. The first panel, “Career on Fire: Engineering an Integrated, Rewarding Lifestyle,” focused on living mindfully as a professional with responsibilities outside the workplace. The panelists: Viacom International Media Networks (VIMN) Senior Vice President Kate Laverge, Drop the Ball author Tiffany Dufu, Viacom Catalyst Senior Vice President Cheryl Family, and Human Resources Vice President Lisa Sipress. Brooke Ozaydinli, senior manager Viacom Marketing Strategy, moderated. Laverge offered her opinion: having it all depends on individual objectives, values and ambitions. Sipress shared her views as a working mother. “I struggle to have it all,” said Sipress. She discussed feeling guilty, and how she combats this guilt. Her resolution is to have a constant internal conversation around balancing work and personal responsibilities. Some days, Sipress said, work must come first. Other days, parenthood is the priority. Dufu has evolved to believe this is an important question, especially for women. After connecting with women one-on-one, the author (who is passionate about helping women and girls advance into different levels of leadership) realized how much time women spend juggling different, unrelated tasks. “Women are managing a lot of different things,” said Dufu. “Women are constantly negotiating between their ambition, their desire to get to the highest level of leadership and achieve mastery of their craft…I think it’s important to define ‘having it all.’ For me, it means having a career driven by my passion and purpose, having a healthy relationship with my partner, raising children who are conscious, global citizens, and being joyful and fit. The takeaway: There are only 24 hours in a day so prioritize what matters most. Learn how to outsource the lower priorities. Avoid self-imposed perfection. At “Decoding the Keys to Great Leadership,” a panel of Viacom leaders spoke about their career highlights and obstacles. 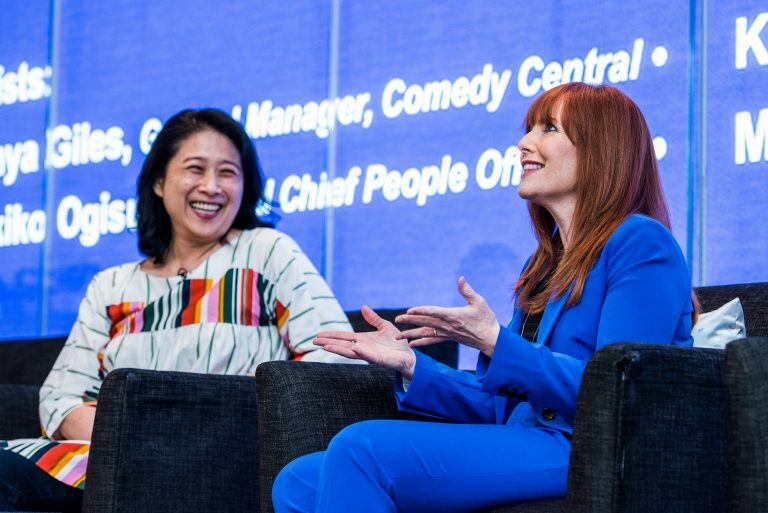 The panelists included Comedy Central General Manager Tanya Giles, Viacom Executive Vice President and Chief People Office Fukiko Ogisu, Nickelodeon Executive Vice President and Chief Creative Officer Kim Rosenblum, and VIMN Chief Operating Officer Melody Tan. Nickelodeon Chief Marketing Officer and President, Viacom/Nickelodeon Global Consumer Products Group Pam Kaufman moderated. When she was in college, VIMN COO Melody Tan wanted to be an MTV veejay. While that never happened, it turned out that Viacom had ample opportunity for someone with her strengths: management and leadership. Before Ogisu came to Viacom, she studied Japanese and Russian history at Duke University and earned a master’s degree in East Asian Languages & Civilization from the University of Chicago, all in the hopes of attaining a Ph.D. in Japanese literature. Instead, she ended up working for Encyclopedia Britannica and as an associate editor at Microsoft, starting as a content editor and gradually working her way to product unit manager for the company’s live services group (leading projects including X-Box Live). Ogisu’s ever-changing path illuminates something vital for newcomers in any industry: it’s okay to change paths in your academic or professional career. It’s okay to feel trepidation over whether or not you’ve chosen the right industry, and it’s okay to explore other options. After all, once Ogisu came to Viacom to work in HR at the behest of an old Microsoft colleague who had transferred to this company, she encountered a friendly, capable staff. “I just won the lottery,” said Ogisu. It’s now been 10 years since she made that leap. Kaufman is part of an organization called The Bottomless Closet, which helps provide professional clothing, shoes, and accessories to women in need of a job. The service also offers resume help, interview preparation and other resources. Several other panels throughout the day resonated in different ways. During “Community Refresh: Connecting with Women in Business,” panelists (Paramount Network Senior Vice President of Talent Jennifer Clark, Viacom International Media Networks Executive Vice President of Ad Sales Strategy Kalina Nikolova, WIE Network / The Other Festival Founder Dee Poku and ColorComm President Lauren Wesley Wilson) focused on creating an authentic community. Zalis asked other panelists if they worried about being likable in business, or if there was a greater motivation at play. Clark discussed the merits of giving folks a second chance in business if they don’t make a great first impression. At “Bridging the Gap: Elevating Diverse Voices for a Better Future,” panelists (Senior Vice President of Global Franchise Planning Charlotte Castillo, Viacom Media Networks COO Sarah Levy, and Senior Vice President of Human Resources Nancy Newman), discussed the concept of authenticity in the workplace. For women, especially women of color, this can be challenging. MTV, VH1 and Logo President Chris McCarthy also spoke of this type of empathy and understanding at the panel “Better Allies: How Senior Leaders Can Contribute to and Empower Others,” moderated by BET Executive Vice President of Broadcast Media Sales Ray Goulbourne. The panel focused on ways upper management can encourage a culture of respect and kindness, at Viacom and throughout media. 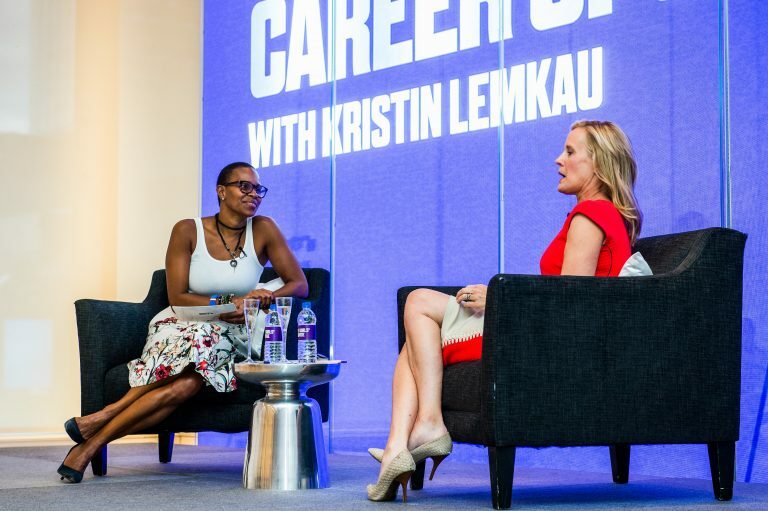 JP Morgan Chase Chief Marketing officer Kristin Lemkau and BET Networks Chief Marketing and Communications Officer Jeanine Liburd capped off the day with a Q&A, “Career Spotlight with Kristin Lemkau,” which also dealt with questions of authenticity. The execs discussed challenges and solutions in their respective careers, as well as “imposter syndrome,” a feeling of inadequacy in one’s industry. The Girls’ Lounge demonstrated Viacom’s culture of creativity and diversity of thought. 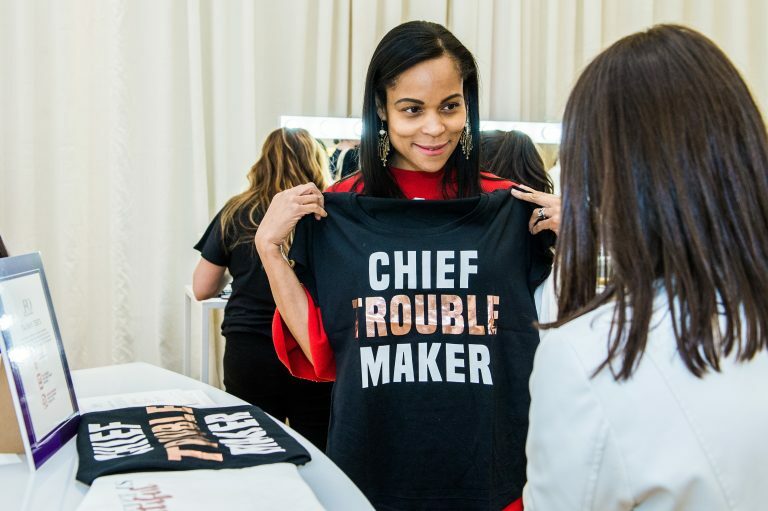 With networking sessions and workshops on negotiating, financial planning and presentation skills, the event served as a reminder of the power of cultivating a support network and working for a company that values empowerment and diversity. For employees, it was a chance to spark conversation in a creative environment with renowned media industry speakers.